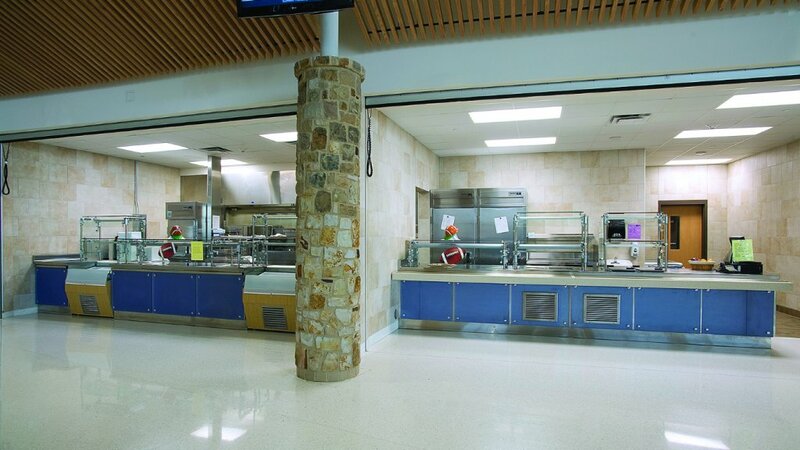 550,000-square-foot Centennial High School complex is the latest successful tankless project for the Burleson (Texas) Independent School District, with 25 units in three systems delivering hot water to food-service and culinary arts kitchens, locker-room sinks and showers, and plumbing facilities in the field house. 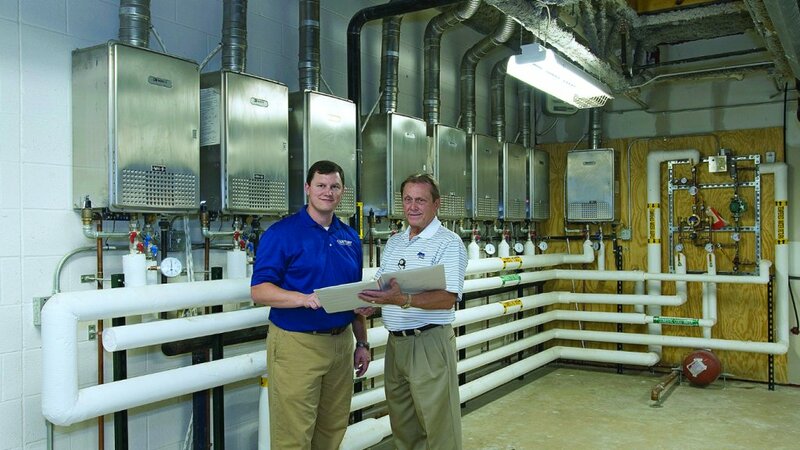 BURLESON, TEXAS — A series of successful installations have made construction manager Cliff Holden a big believer in tankless water heating systems for the school-building projects he oversees. 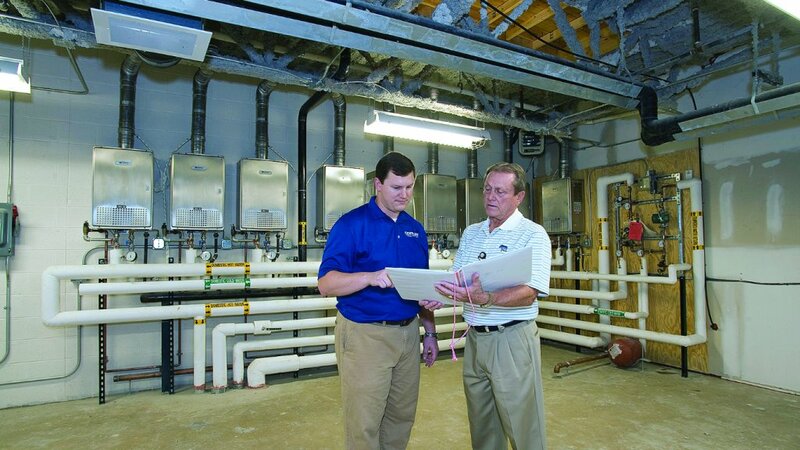 Since 2007, the 15-unit Burleson (Texas) Independent School District (BISD) has erected six new educational facilities under Holden’s direction, and the latest three have all featured multiple-unit, tankless solutions — in no small part because he wholeheartedly championed the idea. 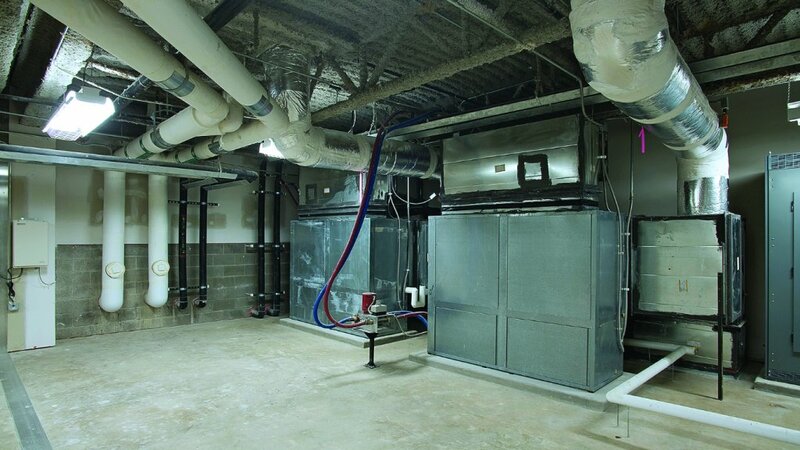 A commitment to maximizing energy efficiency helped spur BISD’s move to tankless in 2009 with the construction of Clinkscale, one of 10 elementary schools in the district. (The BISD also includes two middle school operations and one other high school besides Centennial.) As Holden notes, that commitment is also why Clinkscale, Centennial and the Academy at Nola Dunn — the third new-construction project in recent years to use tankless — feature an assortment of green construction materials and methods. Among the most important: ground source heat pump technology from either Florida Heat Pumps (Centennial and Nola Dunn) or Climatemaster (Clinkscale) for space heating and cooling, rather than conventional heating and cooling systems. But the conversion still convinced BISD management that they had made the right choice — in terms of both performance and energy savings — by switching to a multi-unit tankless solution. 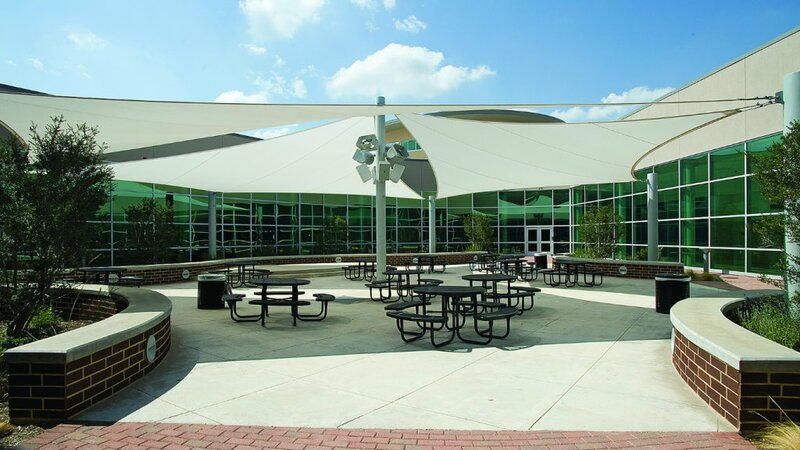 After a second successful install at Clinkscale and with a third project underway at Nola Dunn, the BISD was ready for the challenge of the $117.5 million Centennial projects, whose construction began in June 2008 and finished in the fall of 2010, just in time for the new school year. Situated on a 152-acre site, Centennial has a capacity of 2,000 students at four grade levels. Fort Worth-based Century Mechanical Contractors, Inc. (CMC) handled the plumbing and HVAC work at Centennial as well as at Clinkscale and the Academy. 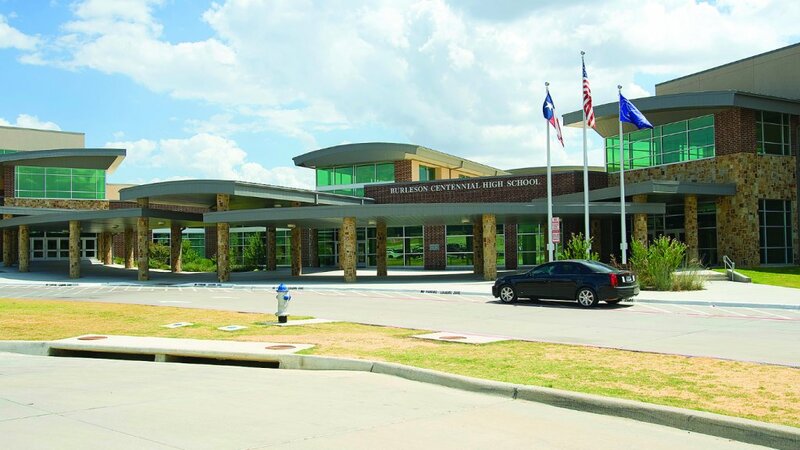 BISD and general contractor Charter Builders of Dallas chose CMC because of the latter’s expertise in geothermal systems, having completed more than 60 such projects in the Dallas-Fort Worth metroplex over the past 16 years. A geothermal solution was especially critical at Centennial because it is a two-story structure, explains project manager Chad Kroeker, P.E. “Not only do I have a Noritz residential unit in my house, but so does my father-in-law. Both installations were retrofits, and we enjoy the energy-saving way these systems work, providing hot water strictly on demand. “The multi-unit installations at Centennial and the other two schools were definitely something new to us at CMC,” he continues, “but because of my previous exposure to the technology, I was totally confident it would work. Cliff Holden felt the same way, thanks to the district’s experiences at the stadium and the elementary school. One building, three hot-water systems: The size and floor plan of the main structure at Centennial are large and complicated enough to warrant three separate hot-water zones, according to Kroeker. 1. Kitchen facilities: Extending from the building’s circular hub are four different wings. Three house classrooms, and in one of these is the culinary arts kitchen for teaching. Contained within the hub is the cafeteria and food-service kitchen for preparing student meals. Close by — so the hot water need not travel far — are six gas-fired, high-efficiency condensing tankless water heaters with an efficiency rating of 93 percent and gas inputs of 199,000 Btuh. A dedicated system controller, located in the same space, maintains a constant output temperature, independent of the usage. Venting was done with flexible and easy-to-install PVC pipe (four inches in diameter). 2. Gym wing locker rooms: The fourth wing of the main building contains the school gymnasiums and their adjoining locker rooms. 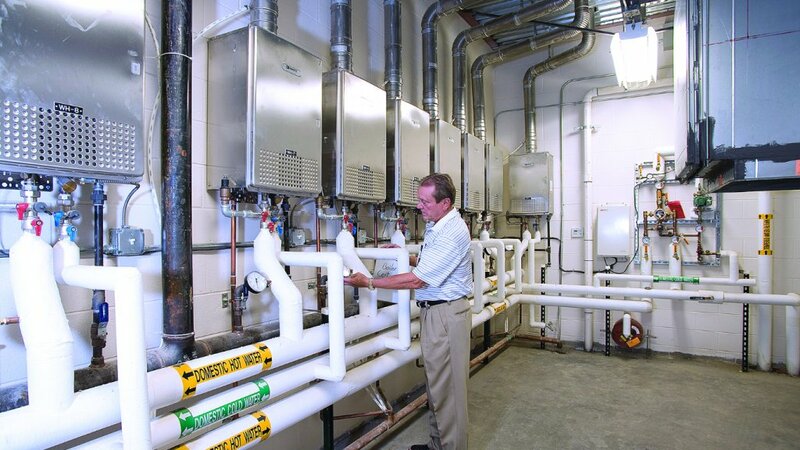 These receive hot water from a mechanical room on the mezzanine level of this wing where nine, gas-fired tankless units with inputs up to 380,000 Btuh are linked together and also operated by a single controller. Because the nine tankless heaters are conventional atmospheric units, venting consists of five-inch, Category III Stainless Steel. 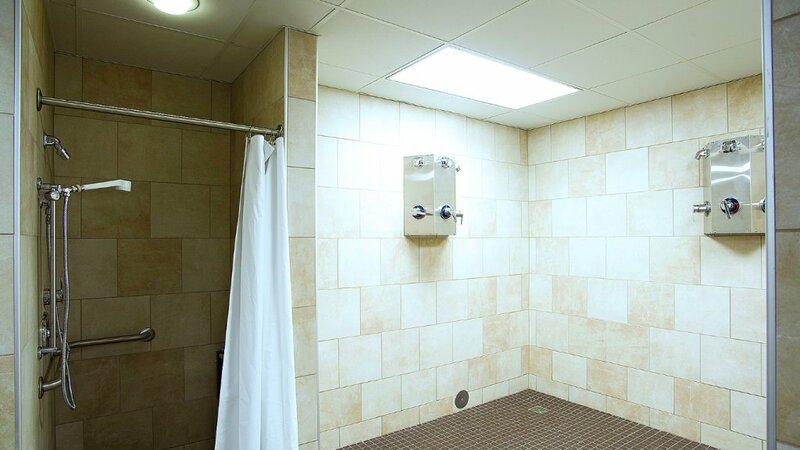 The school district understandably wanted to minimize the wait at the tap and shower head by bringing the hot-water lines as close as possible to the outlet. Consequently, a 600-foot loop of three-inch, copper pipe was built to connect the plumbing fixtures to the nine-unit tankless system. The system sits idle until the temperature of the water in the loop drops below a preset level, at which point the controller activates a circulator to begin pumping hot water from the tankless system. The number of units firing at any one time depends on the number of showers and faucets in operation. Kroeker acknowledges that the system startup involved a learning curve because of the piping circuit’s length and the volume of water it holds: 420 gallons. The system uses a mixing valve to regulate the temperature in the loop. But because of the additional pressure drop through the tankless units, maintaining the preset temperature proved elusive at first. “When there was little or no demand, the water returning from the locker rooms wanted to stay in the loop rather than returning to the tankless system, so the loop would cool down too far,” explains Kroeker, who says the adjustment of a balancing valve and a few other systems “tweaks” ultimately solved the problem. “We had not encountered this problem on the Clinkscale project or even with the kitchens at Centennial,” he continues. “In both instances, the mixing valves were located at the individual handwashing fixtures, while the dishwashers and other kitchen fixtures generally need hot water only. With the sinks and showers in the locker rooms, however, the water had to be tempered to a greater degree. 3. Restrooms: Seventy-five, electric point-of-use instantaneous water heaters, made by Stiebel Eltron, serve the various restroom facilities in the other three wings of the school. For the most part, each POU unit is connected to a single sink; however, wherever sinks are positioned back-to-back with a continuous wall in between, a double-sized unit will be used to generate hot water for both. 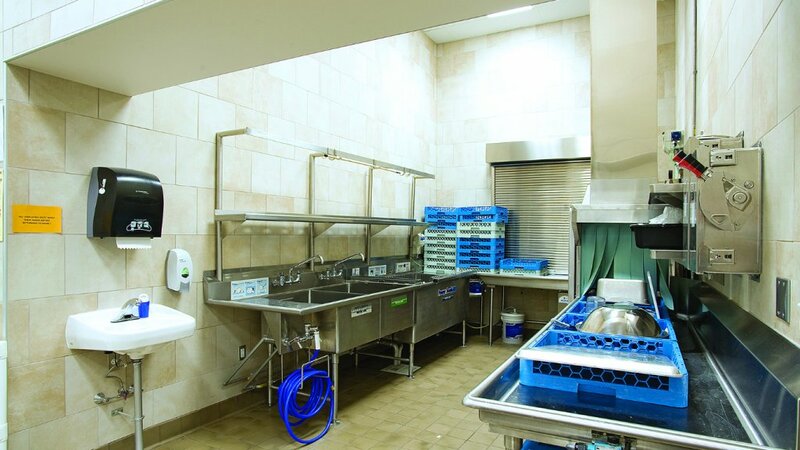 Holden made the decision to use POU technology for a couple of reasons, he says: Hot-water demand, which is confined to handwashing at the restroom sinks, would be very light and intermittent. These factors, combined with the fact that the restrooms are dispersed over three separate wings, spurred Holden to find a way to eliminate the hot-water circulating system he had previously relied upon to deliver hot water quickly. “With POU, we still get warm water to the sinks quickly, but without using a lot of energy and copper tubing to circulate it around the building 24/7,” he explains. 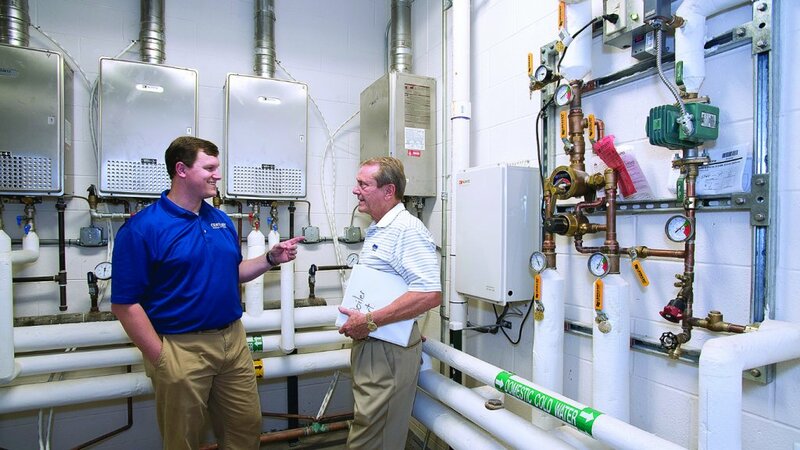 Installation — involved, but not difficult: The nearby indoor practice facility is equipped with virtually the same system as was installed in the gym wing of the main building, except that 10 — rather than nine — Noritz, 380,000 Btuh tankless units were used. Once again, five-inch stainless steel was used to build the vent runs. Project manager Kroeker reports that the overall installation “probably took a little longer than a conventional tank-type system would have required,” but mainly because this was the job superintendant’s first encounter with tankless. 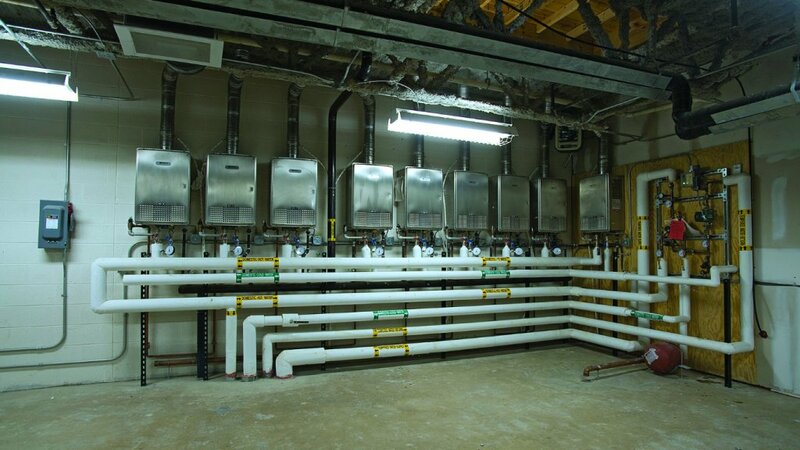 “Below each tankless unit are two tees, one for incoming cold water and the second for outgoing hot water. All those pieces and connections weren’t all that difficult for our plumbers to make, but assembling them did take time. Kroeker also regards the multiple-unit strategy as a huge advantage for any application that simply cannot do without hot water for any duration. “You see a lot of commercial applications, especially restaurants and schools, with two tank heaters whose total storage capacity roughly matches the peak demand of the project. As a result, if one goes down, the operation doesn’t have enough hot water. Construction manager Holden does not yet have comparative figures to determine precisely how cost-effectively the various hot-water systems at Centennial performed during their first-ever school year in 2010-2011. But based on what he can see, the maiden voyage was an unqualified success with “no problems with any of the systems, tankless or point-of-use.